First-time claims for unemployment benefits suddenly fell to the lowest level since early 2006, but don't break out the champagne just yet. About 292,000 people filed initial claims for unemployment benefits in the week ending September 7, the Labor Department reported Thursday morning. 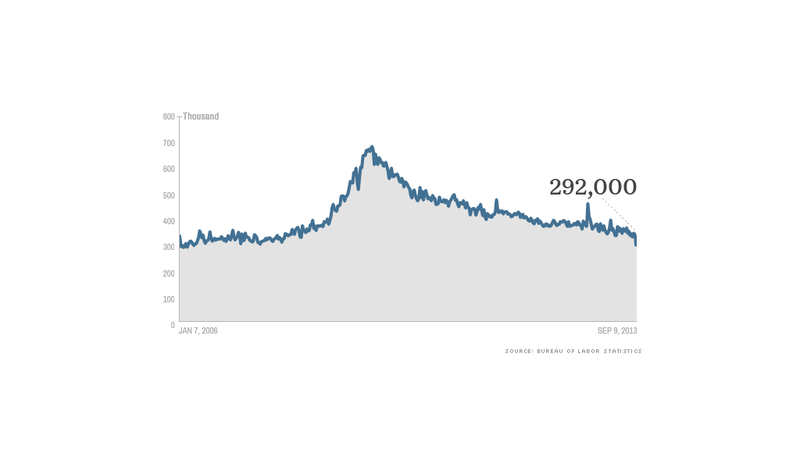 That's a dramatic 31,000 drop to the lowest level since April 2006. However, the Labor Department noted that two states reported incomplete results, possibly due to complications as they updated their computer systems. Once those states submit their final data, the total is likely to be revised higher in the next few weeks. "Take a grain of salt and call me next Thursday," noted Jonathan Basile, director of U.S. Economics at Credit Suisse, in a report to clients. The 4-week moving average, which smooths out some of the volatility, fell to 321,250. Claims had already been hovering around the lowest levels since 2008, and overall, the picture of the job market remains the same. Fewer companies are laying off workers, but hiring for new jobs remains far too slow to aid the 11.3 million Americans who remain unemployed. There are about three unemployed people for every job opening. "The underlying story in jobless claims is one of a continued improvement," said Yelena Shulyatyeva, a market economist at BNP Paribas. "However, as we continue to highlight, claims have not provided the best read on overall labor market conditions since they only capture the pace of firing and not what is happening on the hiring front." The August jobs report showed the unemployment rate is falling but for the wrong reasons, as people drop out of the labor market. Given these mixed signals, it's unclear whether the Federal Reserve will start slowing its stimulus program at its policymaking meeting next week.